When you pry open the box that holds your new handset, you might go, "It's got a Qualcomm Snapdragon processor — sounds legit!" without really knowing what that means. (You wouldn't be the only one.) But that single component is so much more than your average computer chip. With the infographic below as a guide, let's take a look at how the processor is truly the heart, brain, and muscle of the supercomputer in your pocket. Speaking broadly, the processor powering any smartphone is known as a System-on-a-Chip, or SoC. It's your silicon workhorse, handling the heavy-lifting when it comes to memory, graphics, video and photo rendering capability. It's the raw power behind your everyday apps and favorite games. But all processors are not created equal. A multi-core processor, graphical processing unit, and memory controller are all integrated on a single, teensy integrated circuit, and, if you've got a Snapdragon series chipset riding under the hood, basebands for WiFi and cellular. All this lives on a die roughly the size of a dime—the transistors (the tiny computing bits that talk to one another) are spaced mere nanometers apart (that's thinner than a human hair). You're dealing with a truly all-in-one piece of tech. Qualcomm has been making Snapdragon processors since 2008, and is constantly improving the power of its guts, all to make sure you get great battery life while you're multitasking between your favorite HD game and texting your friends. The take-away? In the post-PC age, these little dragons will only get more and more incredible. Take a look at how it all works below. 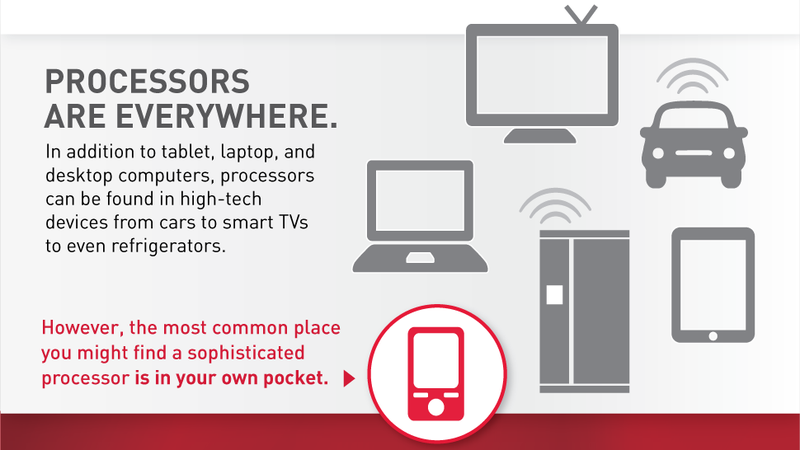 Click here to see what else Qualcomm's superpowered processors can do.